Make an impact with an easy-to-assemble, eye-catching 30ft inline display. Our wide array of 30ft wide off-the-shelf display types ensure that you will find the perfect solution for your needs - simple to sophisticated. All displays are paired with state-of-the-art graphics to add a contemporary and eye-catching message. Fast, collapsible 30ft wide displays offer strength, reliability, speed and style. 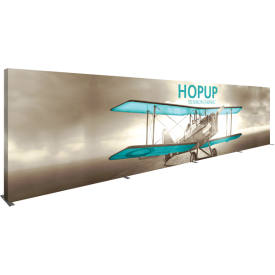 Collapsible 30ft wide display options include the popular Hopup and Embrace systems. 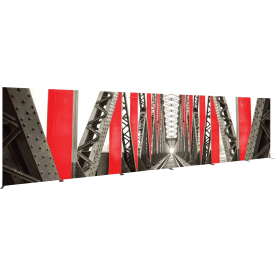 The 30ft wide Hopup is comprised of one large frame and pre-attached fabric graphic. Assembly is easy and fast –simply popup the frame and push-together the connecting arms. Assembly requires two people. 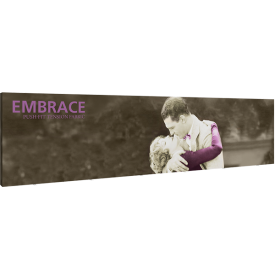 The 30ft wide Embrace features two frames connected with clamps and one seamless push-fit fabric graphic. Formulate and Modulate™ 30ft wide displays feature lightweight tube structures and zipper pillowcase fabric graphics. 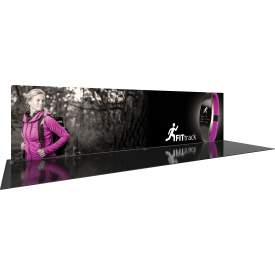 The innovative Formulate® Designer Series 30ft inline displays are available in several options, including Straight, Straight Layered, Vertical Curve, Horizontal Curve and Serpentine Curve, making it simple to find the stunning display that fits your needs. Modulate™ 30ft wide displays reconfigure into 20ft and 10ft sizes, making this system one that will maximize the investment in a display system. Modulate also features lightweight tube structures and pillowcase fabric graphics. Vector Frame™ 30ft simple backwalls and light boxes combine silicone edge (SEG) push-fit fabric graphics and aluminum extrusions; these displays are simple, contemporary, and easy to assemble. Vector Frame is an excellent display choice for use in retail environments, corporate interiors, and for event and tradeshow use as well.